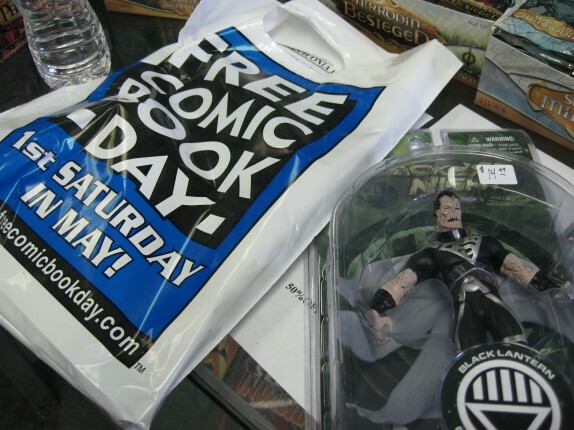 So this is the first year since 2004 that I was able to partake in Free Comic Book Day. It is usually scheduled for the first Saturday in May, and I am usually out of town celebrating my father’s birthday that weekend. 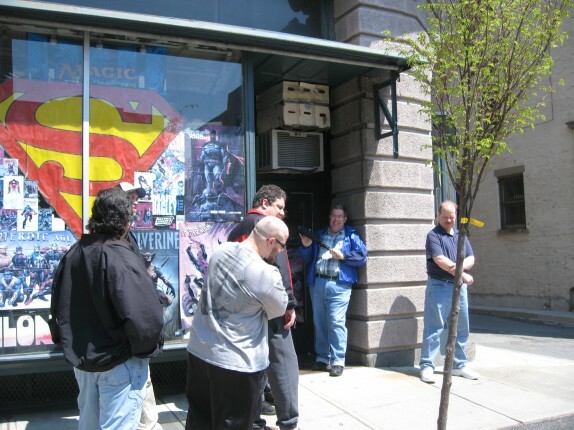 Since that celebration was last weekend for some crazy reason, I was in the Capital District of NY for Free Comic Book Day. 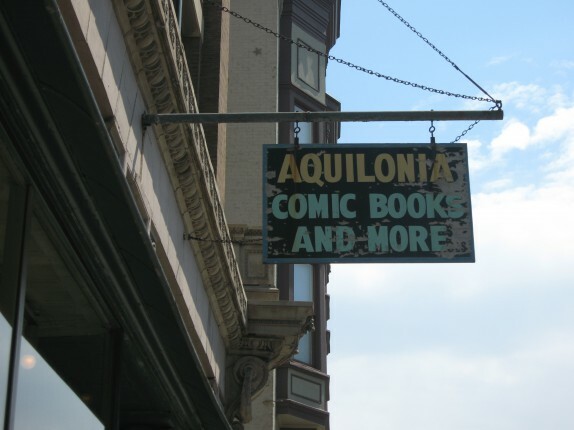 So I trekked down to my favorite comic book store, Aquilonia Comics in Troy, NY. 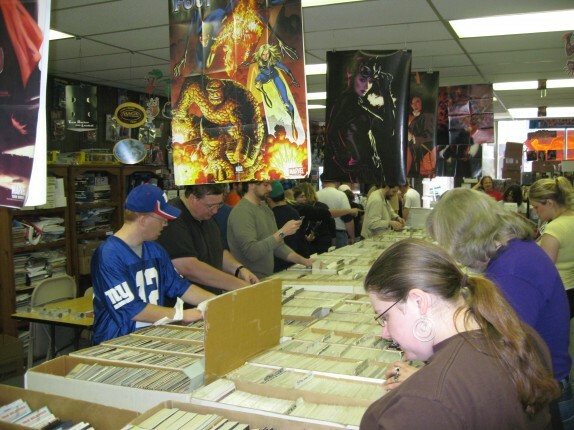 Free Comic Book Day has become a yearly tradition for comic book store owners, as they can get special books published for that specific day at a lower cost to draw customers into the store in hopes to turn around some other sales. 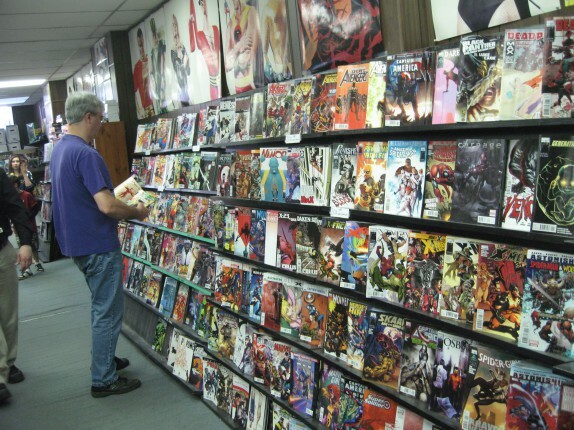 Many places take this many steps further and feature cosplay actors depicting superhero favorites. 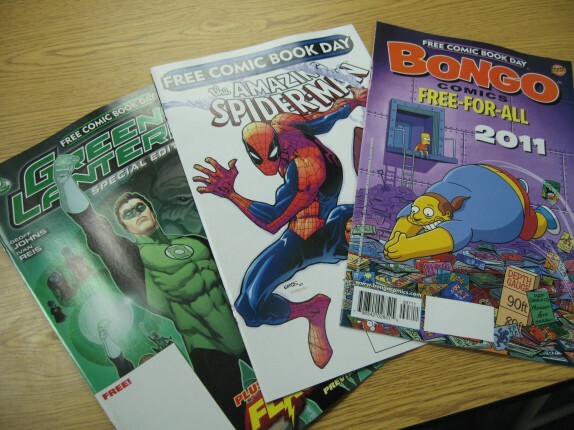 As much of a comic nerd as I am, I appreciate the simplicity of Free Comic Book day at Aquilonia. 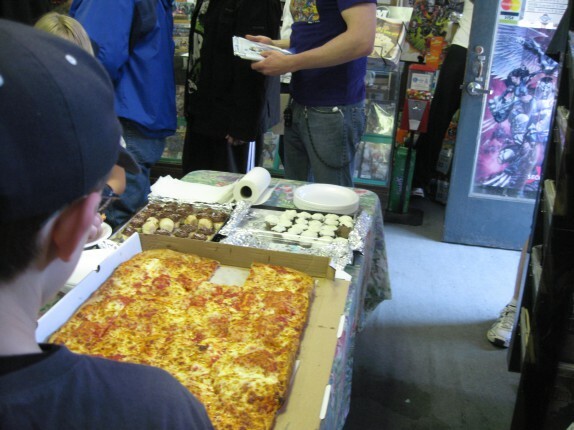 They don’t get people in costume; they get pizza and cupcakes and give insane discounts. 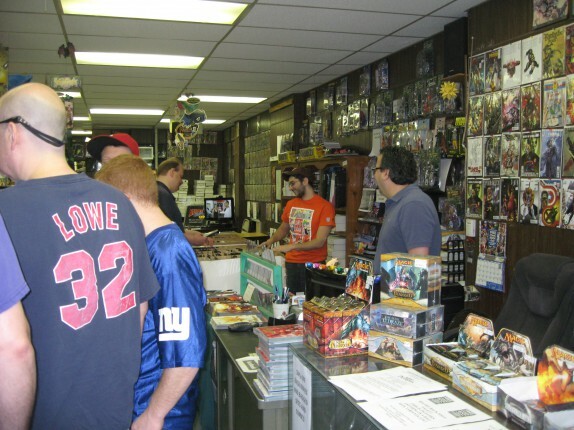 So once they opened the doors at 12 Noon Sharp, we (some normal people, some crazy people, and I) made our way into the store. I’d say there were about 40 people including little kids who were lined up to get in. Having never actually done a good thing in my life, I let the young children in with their parents ahead of me. 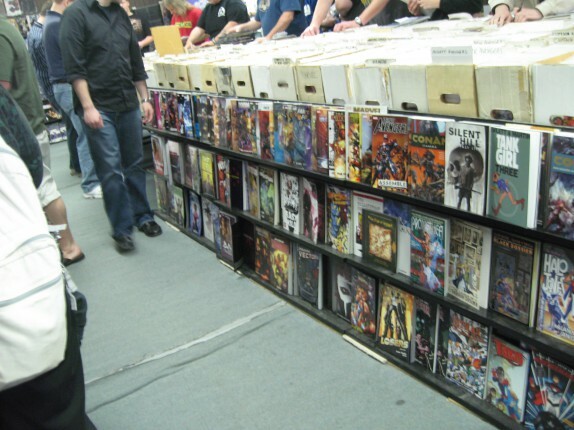 When I got to the rack with the free comics, I selected my free books, making sure to not dilly-dally like the other people were doing, so as to not cause a delay for the 30 or so people behind me. 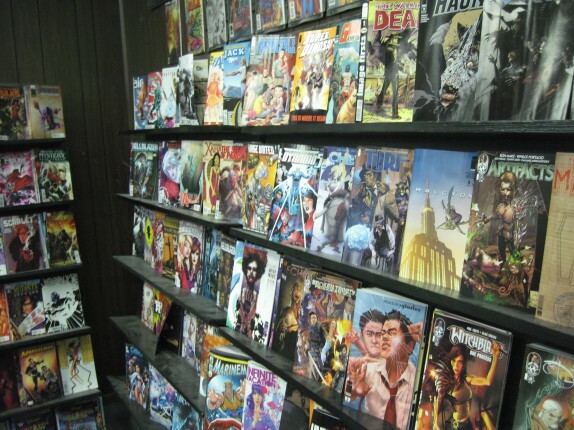 I then fought my way to the back of the store and took some pictures of the shop. While I was at the back of the store, I got to meet a young man named Jeff Burns, who had an HD television and video camera set up. 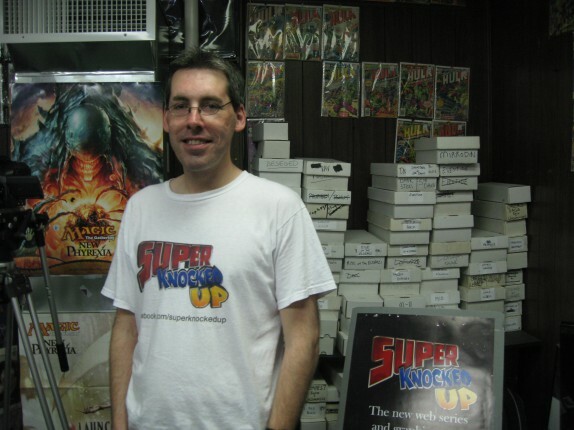 He is involved in a project called “Super Knocked Up,” a web series about a female super-villain who gets knocked up by a superhero. He was very eager to explain more to me, and the more and more he said, the more and more awesome it sounded. 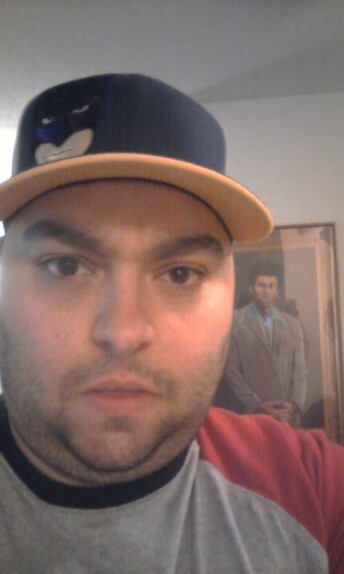 I took his business card and a refrigerator magnet and have checked it out on twitter and facebook. You’re going to want to check this out. It will be can’t miss! Viddy well. Viddy Well. I made my way browsing through the store and my droog, dyscipleX, joined me [he lives nearby, within comfortable bicycle distance]. By this point, I took some time to talk with the employees. 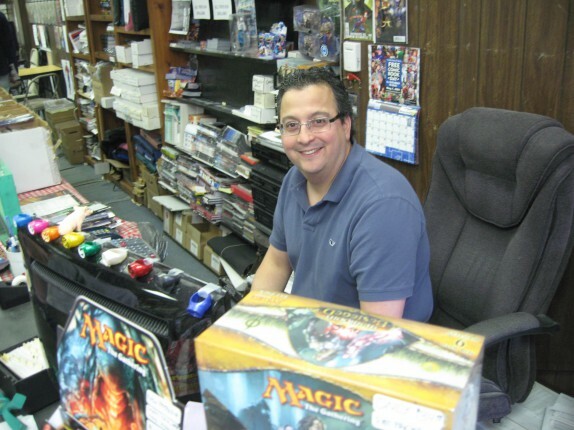 I spent most of my time speaking with Marc, a buddy of mine who helps out in the store sporadically and who comes from blood relation to a Latham family pizza dynasty, but I also spoke with Landen, another young man who works there regularly, and the proprietor, Bob, depicted below. As for your humble narrator, I got away pretty cheap. 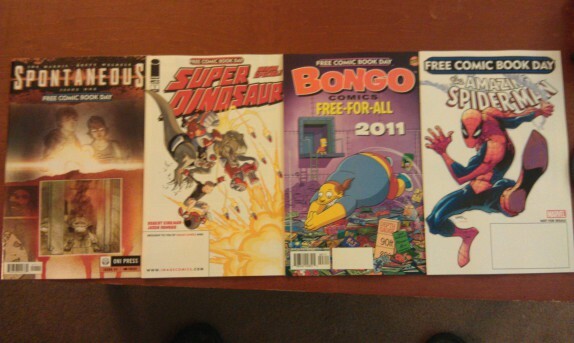 I had four books as part of my normal subscription which totaled $11 after my 20 % subscriber discount that anybody can get as long as they start a subscription and promise to pick up whatever they subscribe to [and another thing: if you ever need to cancel your subscription, just call them and tell them; don’t be a jerk and let the subscription pile up with no notice like other people and bloggers out there]. 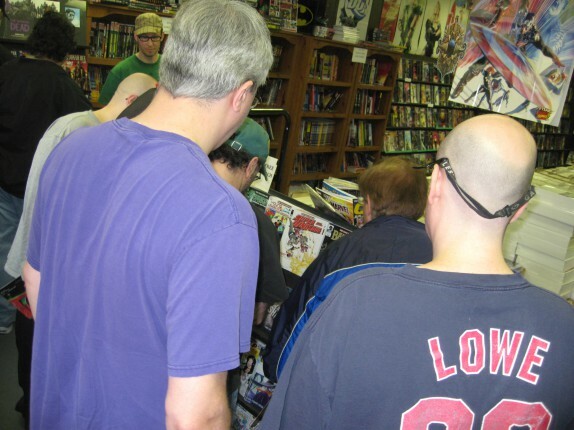 There was another special I saw when I got to the front counter: all action figures – $10. So I picked up the Blackest Night Zombie Earth-2 Superman figure that I’ve had my eye on for a while. I also filled my gulliver with a slice of pizza (from Red Front) and a cupcake; I stopped it there; I had to! 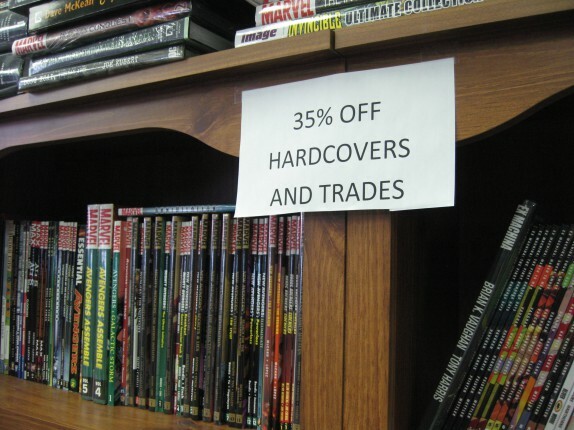 Marc actually made me break the rules of “Only 3 ‘Free Comic Book Day’ Books per client,” so I went home with four books, none of which I know anything about. Actually I do know something about the Bongo book. Every time I have gotten this book, it has been fun, and not filled with a little of the old ultraviolence. It was a very fun afternoon activity, and something I wish happened more often and that I can participate in more often. There was a great turnout. I got to see some customers I remember from my days as a graduate student, when I could hang out at noon on Wednesdays for the launch of the new books. A reader also introduced himself to me; it was a pleasant surprise and very nice to meet him. dyscipleX also had a great time, and thought it was cool that I introduced him to the staff there. 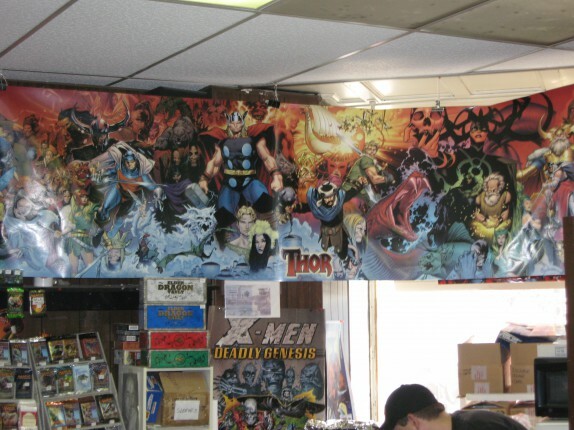 You should have gone up to Excellent Adventures in Ballston Spa, they had artists there with original works, as well as signing their comics..Hope to see you either at the Toy Show in June or at the next Comic Con in October. Actually, I was thinking to do hit all of the area shops next year, if I’m in town. That’s the only way I think I’d be able to one-up this post, and I think it would be fun for lots!